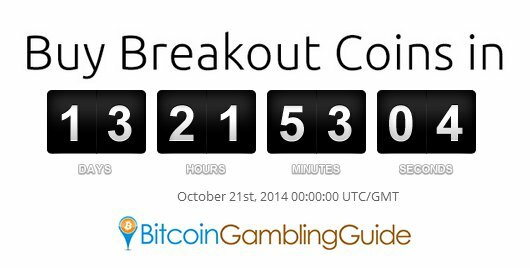 It has been teasing the online gambling community for quite a while now, but Breakout Gaming is finally offering its Breakout Coins (BRO) on Oct. 21. The initial coin offering (ICO) of the said coin will take place in exactly 13 days and 21 hours as of writing, and therefore, this will enable interested and potential customers to get their hands on some BRO coins, which will then be used for betting purposes on the Breakout Gaming platform. Early participants in the ICO will receive valuable incentives through the additional BRO they will get as a bonus. According to the table shown on the website, buyers in the first decile are entitled to the 10% bonus while those in the second decile will receive 8% more BRO. The bonus percentage decreases by 2% until the fifth decile whereas customers in the lower half up to the tenth decile will be awarded with incentives proportionally. The funds generated from the Breakout ICO will be allotted for the future developments of the system, including marketing for BRO and Breakout Gaming, stealth address wallet, custom Bergstake pools, continued Bergstake development, and the ongoing security maintenance of the coin among others. Moreover, the distribution schedule of the BRO coins is devised in such a way that a total of 7 million BRO will be given away to customers for free via the incentive programs. These programs will take the form of free tournaments, sign-up and referral bonuses, and other ways Breakout Gaming will soon unveil. A newcomer in the world of alternative cryptocurrency gambling, Breakout Gaming introduces an ambitious yet promising kind of online gambling that is a step ahead of the currently popular Bitcoin gambling. Instead of simply using Bitcoin to power its online gambling platform, Breakout Gaming decided to bring forth its own exclusive coin. Backed by a roster of international and professional poker players like Johnny Chan, Ted Forrest, Todd Brunson, Jennifer Harman, and David Benyamine to name a few, the new brand in the cryptocurrency gambling market will be featuring 88 casino games, a poker room, and fantasy sports. All set to go, will Breakout Gaming truly revolutionize Bitcoin gambling?